The three books in The Durham Trilogy are The Hungry Hills, The Darkening Skies, and Never Stand Alone. The Hungry Hills is set in a County Durham mining community during the conflict of the 1926 General Strike. It’s a tribute to the courage and fortitude of the Durham mining communities and especially the Durham women. The book is dedicated to my stillborn son and also portrays the feelings and reactions to a stillbirth. “Written with compassion, humour and a vivid intimacy, The Hungry Hills is an unforgettable saga of two very different families living through the dramas and tragedies of 1920’s England”, and marked my saga-writing début. I was delighted when it was short-listed for the Sunday Times Young Writers award in 1993. Ever since I took part in a T.V. documentary on the General Strike as an 8 year old, I have wanted to write about the mining communities of the North-East of England. I played the daughter of coalowner Lord Lambton on T.V. for only a few moments, but it made a lasting impression on me! The book, which is dedicated to our stillborn son Stanley, also gave me the opportunity to express in a fictional context some of my feelings and experiences following our own tragedy. The Darkening Skies is a sequel to The Hungry Hills and continues the story of the fictitious mining community in County Durham. It follows the fortunes of the Dimarcos, an Italian family caught on the ‘wrong side’ at the outbreak of the Second World War. The once popular and accepted ice-cream parlour owners face increasing hostility. Many Italians face harsh treatment in the war years, as they were indiscriminately rounded up and interred, their shops attacked and their families left to struggle on alone. With its vivid backdrop of a pit-town strained by the tensions of war, The Darkening Skies is a vibrant and moving story of conflicting loyalties, passions and cultures. The book is set against the fascinatingly vivid backdrop of a momentous turning point in recent history, the 1984 miners’ strike. Set in a pit village on the Durham coast, it charts the bitter struggle between the National Union of Mineworkers [The NUM] lead by Arthur Scargill and the Conservative government lead by Margaret Thatcher. Never Stand Alone is a powerful and heartrending story of the people caught up in the divisive dispute. At the heart of the storm is the passionate relationship between Carol, the pit manager’s rebellious daughter and Mick, one of the miners. The battle that is dividing the nation and threatening the survival of their community could also destroy their union. 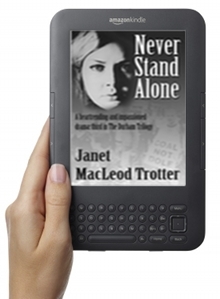 Never Stand Alone was something of a departure for me, being a much more contemporary novel – what I would call a ‘recent memory saga’. The consequences of the strike are still being felt today and the book was written largely for people, like myself, who lived through the strike but had little or no understanding of the acute hardship that the miners and their families suffered. In particular, the courage and fortitude of the women are celebrated and the book is a tribute to them. Whilst this is a family saga I also hope that it will challenge the reader to re-visit 1984 in the light of subsequent events.